It’s a big day in the deep south as the two super-trimarans Spindrift Racing and IDEC Sport round Cape Horn and turn north for home. They have traveled well over 15,000 miles with a little over 7,000 to go. What an amazing race it has been as both boats attempt to beat the Jules Verne record time of 45 days, 13 hours, 42 minutes and 53 seconds. Right now Spindrift has a comfortable lead over the current record holder Banque Populaire V. As they rounded Cape Horn earlier today they were almost 500 miles ahead of BankPop’s benchmark time. IDEC Sport is also ahead but by only 175 miles which at the speed they are traveling is around seven hours of sailing time. The passage across the Southern Ocean was not as easy as it might have been as the proximity of ice kept the boats further north than they would have liked and much further north of the course that Banque Populaire V sailed in 2012. This means that the two current record chasers had to sail a longer distance while Banque Populaire V could sail closer to the great circle route. But getting out of the Southern Ocean unscathed is a victory in itself and for sure a relief for the crews on both boats. 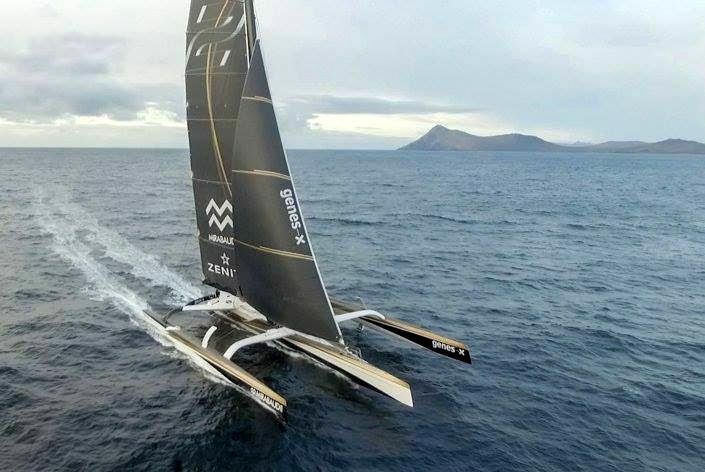 Banque Populaire V had a relatively easy trip up the Atlantic so there are no easy miles to clip off her time, but if Yann Guichard and his crew on Spindrift are able to stay out of any high pressure systems and avoid breakages they may well get this one. Trickier for IDEC Sport which is a much smaller boat than the other two. In the Southern Ocean it’s all about slowing down to remain in control. Going north it’s about boat speed and there is nothing like boat length to translate into pure boat speed. With around 7,000 nautical miles to go and 15 days in which to cover the distance it does seem possible, if not probable, that Spindrift at least will crack the record. They have to cover 460 odd miles a day at an average speed of around 20 knots. That seems pretty doable you say, but don’t forget that there are two massive high pressure systems to negotiate as well as the doldrums which can slow a boat down for days. And then there is the approach. They will be getting back to Northern Europe in the dead of winter at a time when winter gales roll in from across the Atlantic with wind, rain and snow. When Peter Blake and Robin Knox Johnston set their record on ENZA in 1994, their last day was one of the worst of the entire voyage. So while we settle in for ham and eggnog and good cheer let’s spare a thought for those modern day Magellan’s pushing the edges of a flat earth in search of bounty that will come in the form of the Trophée Jules Verne.